The Bruce Dickinson documentary Scream For Me Sarajevo was filmed in the middle of the siege of the city in 1994. The Iron Maiden frontman and his band Skunkworks played a show in Sarajevo amid violence which lasted three and half years and claimed the lives of more 14,000 people. 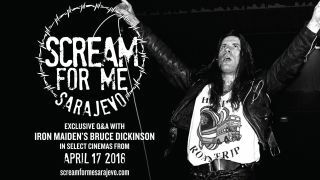 Scream For Me Sarajevo captures the full amazing story with footage from the historic gig and interviews with the band and people who made it to the show, determined to keep living their lives despite the constant threat to their survival. It’s a film about extraordinary people defying the horrors of war, and the musicians who risked their lives to play a show for them. Click on the cover below to access your special souvenir Digital Magazine.